Amblyopia, also known as lazy eye, is a visual disorder caused by abnormal vision development, often occurring during infancy. Patients with amblyopia have reduced vision in one eye, because it is not working properly in conjunction with the brain. With early detection and proper treatment, loss of vision can be avoided for many children. However, when left untreated, amblyopia can cause significantly decreased visual acuity — including legal blindness. When one eye sees clearly and the other does not, the brain tries to overcompensate for the one that does not see as well. Essentially, the brain begins to ignore images sent from the eye that does not see as well as its counterpart. The brain begins to favor the stronger eye over the other, and the eye that is not being used properly develops increasingly poor visual acuity, becoming the amblyopic eye. Amblyopia can be caused by a variety of pre-existing conditions that prevents the amblyopic eye from focusing clearly. Strabismic amblyopia is the most common type of amblyopia and is caused by poorly aligned eyes. If one eye is misaligned, the brain ignores visual input from that eye. This causes underuse in the eye with poorer visual acuity, leading to amblyopia in that eye, or lazy eye. Refractive amblyopia can occur despite perfect eye alignment. In this case, amblyopia is caused by unequal refractive errors in the eyes. For example, one eye may have uncorrected nearsightedness or farsightedness while the other eye does not. In these cases, the brain depends on the eye with the less severe uncorrected error to see, and ignores the images transmitted from the other eye. This causes amblyopia in the underused eye. Deprivation amblyopia is amblyopia caused by something that obstructs light from entering a baby’s eye. A congenital cataract is frequently responsible for this form of amblyopia, and proper treatment is necessary to support continued visual development. Amblyopia is not correctable with glasses or contact lenses alone. However, vision therapy is often an appropriate treatment option. Vision therapy involves an individualized treatment program that is designed to correct or improve visual deficiencies. Vision therapy includes different techniques and eye exercises (depending on the vision deficiency being treated), such as patching the stronger eye to force the brain to pay attention to signals transmitted from the amblyopic eye, eye alignment exercises and eye teaming activities, which help correct and enhance the brain’s ability to communicate with the eyes. It has been found to be far more successful in treating amblyopia than eye surgery or corrective glasses alone. The earlier a child with amblyopia enters vision therapy, the better. 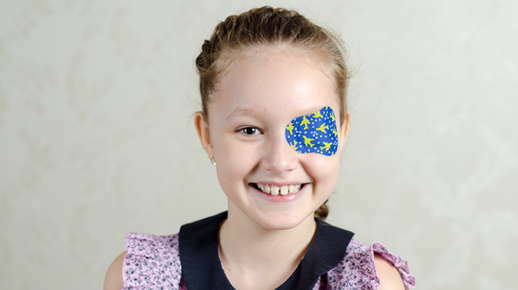 Research has long since disproven the popular belief that older children or even adults with amblyopia cannot be helped; however, it is best to begin treating amblyopia as soon as possible.